I have woken up to a rather large amount of questions this morning regarding how i live with my ileostomy bag. There seems to be some confusion as to whether I can use the toilet or not, so I thought I’d just write a short explanation of how my ileostomy bag works! So… during my surgery, they removed my colon. If you didn’t know, your colon is what absorbs vitamins helps compact your stools, i.e. avoiding diarrhea. This left me with just my small bowel. 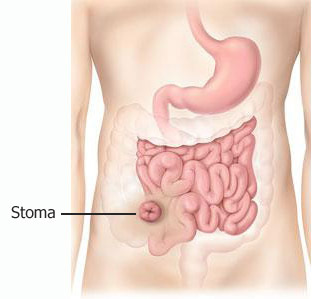 They created an opening in my stomach and brought the end of my small intestine out of my stomach, creating a stoma. As I no longer have my large intestine, I don’t experience hard waste. My digestive system now works a lot faster meaning my body also finds it hard to absorb nutrients. As I no longer have a colon (large intestine), I’m more at risk of dehydration and loss of nutrients. This is because one of the functions of the colon is to re-absorb water and minerals back into the body. I now add a little more salt into my diet to help replace anything lost. The bag on my stomach covers my stoma, attaches on and collects any waste. I’ve had a few questions asking about urination, but considering urination concerns your bladder, nothing has changed on that basis. I still urinate the same. Changing the bag is something I do every day, it is important to ensure the bag fits properly to ensure the bag fits properly, to avoid any extra skin irritation. To change the bag you must first prepare your accessories. Scissors, spray, warm water, dry wipes and of course your bag is needed. I first spray around the sides of the bag I’m wearing to pull the bag off with ease. Next up is to clean around the stoma with warm water and dry wipes. Once clean and dry, I spray around the stoma with a skin barrier spray. I then wait for this to dry, and measure my stoma with a template. Once sized properly, I draw the measured circle to a section of my bag. I then cut this circle, double check the sizing, pull off a cover to reveal the sticky underneath, and smooth onto my skin around my stoma. The end of the bag consists of velcro straps which folds up 3 times. Draining the bag just consists of unfolding the velcro, cleaning, and folding back up again. I hope this is informative enough, I didn’t particularly want to explain everything in detail as some of you may only be interested in the basics. But if you’d like to ask anything else, feel free to contact me. My First Month With An Ileostomy Bag – No Toilet For 4 Weeks!